Contest: Bumblebee Movie Prize Package Giveaway – 2 Winners! Bumblebee Movie Prize Package Giveaway – 2 Winners! 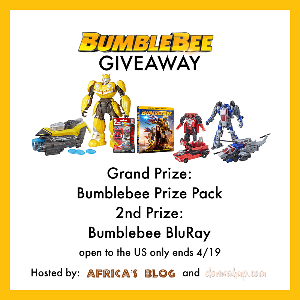 Prize: Grand Prize – a Bumblebee Prize Pack that includes the Blu-ray Combo pack and a variety of Hasbro toys PLUS A second winner will win a copy of Bumbleebee on Blu-Ray.